I have to admit, I wasn’t excited over the China Glaze Summer Neons collection this summer. I am not the biggest fan of neon shades personally. I don’t know why, I like bright colors, but I was never a huge fan of bright pinks, oranges and yellows. Most neon shades are highlighter colors like hot pink and yellow. There are a few blue and green neons but I had never gravitated towards those colors either. That is another reason why I don’t buy too many polishes from summer collections. I have a few really bright blues and greens which I really like but none that are classified as a neon. I didn’t want any of the China Glaze Summer Neon colors until I saw swatches of this beauty on other blogs. I fell absolutely in love and this climbed to the top of the wish list when I went to Ulta of the other day. 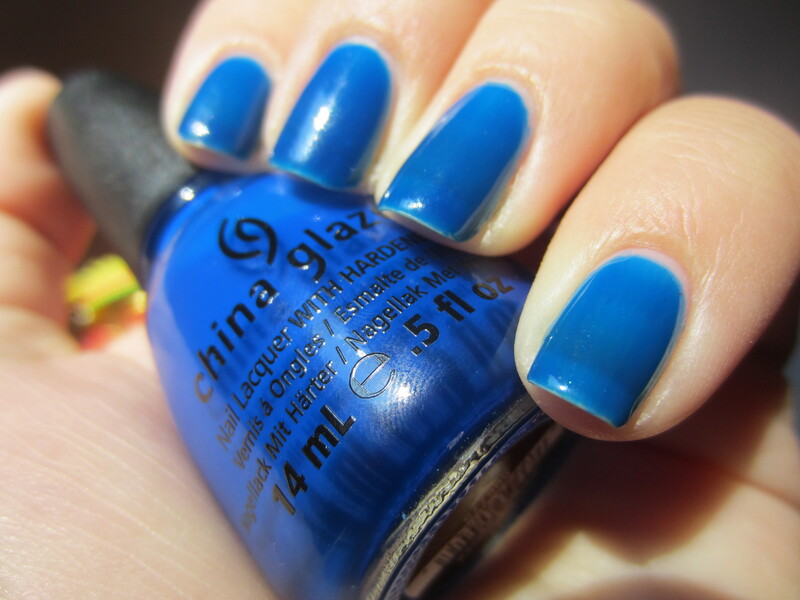 China Glaze “Ride the Waves” is a cerulean blue jelly. I love that I knew the exact color to describe this as! Normally I’m soooo awful describing a color and normally just revert back to the simplified descriptions of colors. But the minute I put this one I literally said out loud, “oh my freaking god, this is the same color as my all time favorite crayola crayon! I have needed this in my life for-freaking-ever” My boyfriend laughed for about 2 minutes, called me a freak and told me I’m way too obsessed, and I didn’t care at all. This my love from 3rd grade in grown-up form. The crayon that I loved so much that I turned every disney princess into a smurf was made into a jelly finish nail polish! Ok, first off, I love jelly polishes. Y’all know that. I think a lot of people are really getting into jelly polishes and I love that Zoya now has 3 jelly polishes coming out (I want every one). This is 3 coats and you can still see my VNL (visible nail line). I don’t really mind it because it really does look like a gummy bear, that is if they made gummy bears in this color. It looks like I could smush my nail down and it would bounce right back up. Or, like a deep dark swimming pool that you can see down to the bottom of. I like the depth of this polish so I don’t mind that it isn’t completely opaque right now, especially because its even and not splotchy. But why I really love this color, aside from the fact that it is a jelly, is the color itself. I know I said I love this shade of blue. I love that in direct sunlight it is super bright and the perfect shade of bright cerulean blue. 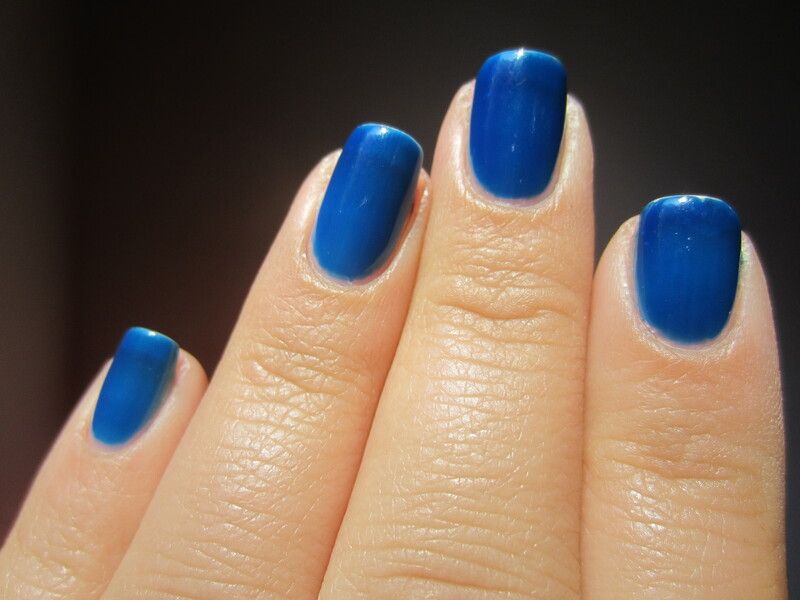 But indoors it looks like the perfect royal blue, almost reaching on a navy. I noticed how dark it was indoors at night and I was seriously in love. I know this is new, but this is definitely climbing to the top of my favorite blues of all time. I love that outdoors, it creeps up to a neon level of brightness, but indoors its a deep royal blue. Its so versatile and has so much depth. Be prepared for some jelly sandwiches with this polishes! very pretty blue! it’s a bit too sheer for me, but maybe would work as a jelly sandwich! The colour is good! I like neon ones. my fave this year would be Julie G bikini i think. But i also have pink plumeria from china glaze. Ohhh did you see wedding white from picture polish anyway? Yes!!! I want that, kryptonite, and amethyst and then Monroe from a previous collection. My picture polish wish list is getting pretty long! You know, I wanted a few colors from the Summer Neons bunch and my Sally’s didn’t have any of the ones I wanted, except this one. I’m happy now that I only purchased Ride the Waves because it is GORGEOUS! Have you ever tried this over white? ?